Source: Kumpulan Resep Tradisional Indonesia. This is one of street dishes in East Java region : Pecel Lele. Pecel is actually refers to Sambal Pecel, a Peanut Sauce/ dressing which usually served with blanched vegetables. But Pecel here means other than this reference. Pecel Lele is a special dish which originated from Lamongan, a municipal city in East Java Province where the famous "Soto Lamongan" comes from. 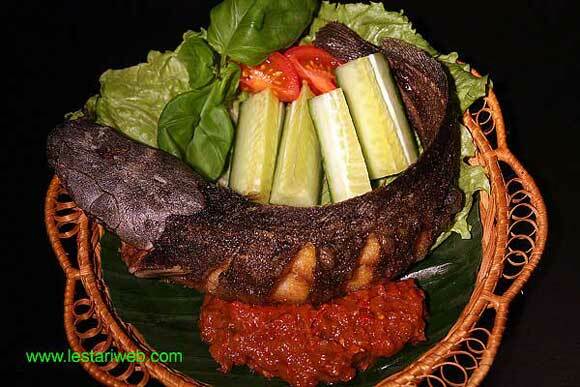 Pecel Lele is a side dish which comprises of Crispy Fried Catfish, serve together with spicy sambal and raw vegetables/salad. But why the name have similarity with Sambal Pecel/ Peanut Dressing, I also have no idea???!! But one thing I can assure you, this is a delicious side dish that I'd love to cook again and again ha ha ;-) A yummy & crunchy fried catfish with HOT & SPICY sambal hmmmmmmmmmmm... a mouth watering Indonesian delicacy !!!! Marinating and Frying the Fish:Clean & discard the fish innard & wash throughly ( rub with lime juice/tamarinde to get rid from fish mucus). Set aside to drain. Grind garlic, turmeric, coriander & salt with stone mortar & pestle into smooth paste. (If you use blender instead mortar, add litlle bit water from 250 ml water to help the blending process). Transfer the mixture in a bowl, add 250 ml water (or rest of water )& stir to mix. Adjust the seasoning liquid, add more sat if necessary. Transfer the fish into the bowl, rub around the fishes with the spaice mixture & let aside for 15 minutes to marinate. Heat 500 ml or enough oil. 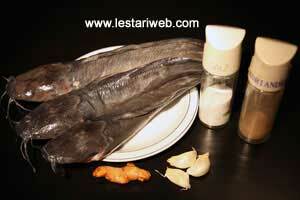 Rub the catfish with the marianting paste then deep-fry the fish until crispy goldbrown. Set aside to drain. Making Sambal Terasi Goreng: Heat 5 tbsp oil in a wok or saucepan over medium heat. Fry chili, shallot, garlic & tomato till just soften. (Do not fry the chili too long otherwise they will be too hard to grind). Transfer all fried ingredients onto grinding stone (or mortar & pestle) and grind until smooth. Add the dried shrimp paste, pound it together to mix. Adjust the sesoning. Add salt & sugar to taste. (If possible use grinding stone not blender. 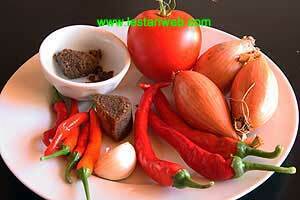 One meal sambal is to be made traditionally to get the best-authentic taste).